Have you struggled? Have you wondered if a lack of peace means you’re headed in the wrong direction? Have you wondered if the struggle is because of disobedience or God prompting you to change directions? Does the confusion get the best of you? It has for me. Why is it that when we pray a mighty prayer, make our requests so big that only God could deliver them, wait, wonder if it’s even possible, then actually receive it, that we still struggle? Why is that? Because we are human beings with mere human hearts and minds that have a hard time comprehending what is meant for us, what is best for us. Have you ever heard, “Be careful what you pray for, you just might get it!” As soon as it arrives, our hearts are frightened and we feel like we’re not ready. If we weren’t ready, why would God drop this in our lap? Something only He could know we wanted. Something straight out of the deepest desires of our heart. Yet, we don’t feel ready. We don’t jump in with joy and excitement and praise His name, like a child would. Nope, we worry. We wonder if it’s right. We wonder if it’s real. We wonder if it’s finally here. And we wonder what to do with it. We pray for discernment, for peace, for direction…for truth. 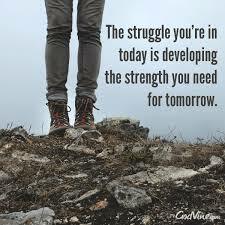 Have you considered that the struggle may be because you ARE heading in the right direction? We tend to think that once our miracle arrives, it will be smooth sailing, but God has another thing in mind. How else would He keep us dependent? How else would He keep us humble? By reminding us we can’t do it alone. By reminding us that getting our prayers answered doesn’t mean everything will be easy, but it will be different. With new territory, there will be new issues to deal with and problems to face. This allows us to praise Him while remaining completely dependent. When we feel incompetent to handle our blessing, He is STILL ever present. Whether it’s a new relationship or an ended one, an unexpected baby or a long-awaited one. Whether it’s your dream job or an opportunity that you’ve waited and prayed so long for, there will be issues. New ones. I’m so thankful that God loves me enough to struggle with me. When my soul desire is to do His will, it means I love Him enough to struggle too. I’d rather struggle with God than silence or deny Him in my heart. One thing’s for sure, just like Jacob struggled with God, we won’t come out the same. We’ll come out closer, changed, and with a limp that keeps us dependent and reminded of God’s sovereignty in our lives . The people who have stayed by our sides in our struggles will always hold a close place in our hearts. Likewise, when we struggle with God, we come out closer and ever more certain of His love for us. There is beauty in the struggle.